rainbow identifiers mode will colorize all identifiers (christmas tree mode :-)) with an almost unique color. color-identifiers mode will colorize only identifiers recognized as variables. 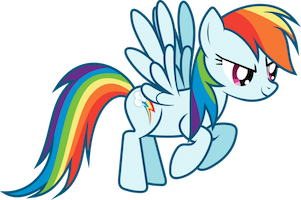 rainbow mode displays strings representing colors with the color they represent as background. nyan mode display a Nyan cat progress bar in the mode-line. To use this configuration layer, add it to your ~/.spacemacs. You will need to add colors to the existing dotspacemacs-configuration-layers list in this file. 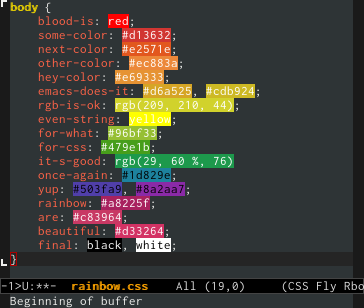 To colorize some identifiers by default in programming language buffers, set the layer variables colors-colorize-identifiers to either variables or all. variables will colorize only words recognized as variables, all will colorize all the words. When using the value all the Saturation and lightness of can be set per theme by adding an entry in the variable colors-theme-identifiers-sat&light. This is an alist where the key is a theme symbol and the value is a pair (saturation lightness). For now saturation and lightness are not supported with the variables value. The prefix associated with colors is C.
Note that the toggle is local to the current buffer.